Dervock (from Irish: Dearbhóg or Dairbheog) is a small village and townland (of 132 acres) in County Antrim, Northern Ireland. It is about 3.5 miles (6 km) northeast of Ballymoney, on the banks of the Dervock River. It is situated in the civil parish of Derrykeighan and the historic barony of Dunluce Lower. It had a population of 714 people (302 households) in the 2011 Census. The village includes a number of commercial businesses, a primary school and doctor’s surgery, as well as recreational and community facilities. The North Irish Horse Inn, a listed building, named after a famous British Army regiment, the namesake North Irish Horse, and has military memorabilia on display inside, and there is also a remembrance fountain built in 1878. Dervock born Ken McArthur won a gold medal for running the marathon whilst representing his adopted country of South Africa at the Olympic games in 1912 held in Stockholm, Sweden. There is now an avenue in Dervock named in his honour. Dervock is the ancestral home of a U.S. president, William McKinley. The paternal grandmother of U.S. political commentator Chris Matthews was born in Dervock and emigrated to Pennsylvania. 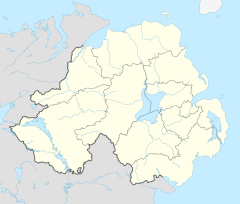 Dervock is classified as a village by the NI Statistics and Research Agency (NISRA) (i.e. with a population between 600 and 1,000 people). On Census day (29 April 2011) there were 711 people living in Dervock. Of these:*22.8% were aged under 16 years and 13.3% were aged 60 and over*47.9% of the population were male and 52.1% were female. 1.2% were from a Catholic background and 98.8% were from a Protestant background. 7.9% of people aged 16–74 were unemployed. Dervock railway station opened on 18 October 1880 but closed on 3 July 1950. It was on the Ballycastle Railway, a narrow gauge railway which ran 17 miles connecting Ballycastle to Ballymoney, on the Belfast and Northern Counties Railway (BNCR), later Northern Counties Committee (NCC), main line to Londonderry. A wall sign in Dervock showing support for the North Antrim and Londonderry brigade of the UDA. ^ "Dervock". IreAtlas Townlands Database. Retrieved 9 May 2015. ^ "Dervock". Census 2011 Results. NI Statistics and Research Agency. Retrieved 30 April 2015. ^ BBC news report, "Kennedy Kane McArthur: Flame still burns for Marathon messenger"
^ "Area Profile of Dervock - Based on 2011 Census". NI Neighbourhood Information Service. Retrieved 2008-07-15. ^ "Dervock station" (PDF). Railscot - Irish Railways. Retrieved 2007-09-23. ^ Baker, Michael HC (1999). Irish Narrow Gauge Railways. A View from the Past. Ian Allan Publishing. ISBN 0-7110-2680-7. Wikimedia Commons has media related to Dervock. This page was last edited on 20 June 2018, at 07:56 (UTC).